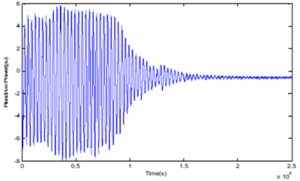 In this study, a static synchronous series compensator (SSSC) is used to investigate the effect of this device in controlling active and reactive powers as well as damping power system oscillations in transient mode. The SSSC equipped with a source of energy in the DC link can supply or absorb the reactive and active power to or from the line. Simulations have been done in MATLAB/SIMULINK environment. Simulation results obtained for selected bus-2 in two machine power system shows the efficacy of this compensator as one of the FACTS devices member in controlling power flows, achieving the desired value for active and reactive powers, and damping oscillations appropriately. It has been found that the SSSC is capable of controlling the flow of power at a desired point on the transmission line. It is also observed that the SSSC injects a fast changing voltage in series with the line irrespective of the magnitude and phase of the line current. Based on obtained simulation results the performance of the SSSC has been examined in a simple two-machine system simply on the selected bus-2, and applications of the SSSC will be extended in future to a complex and multimachine system to investigate the problems related to the various modes of power oscillation in the power systems. Gyugyi, L. (1989). “Solid-state control of AC power transmission.” International Symposium on Electric Energy Conversion in Power System, Capri, Italy, (paper No. T-IP.4). Sen, K.K. (1998). 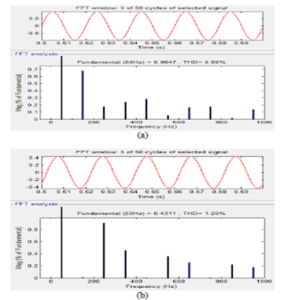 “SSSC-static synchronous series compensator: theory, modeling and publications.” IEEE Trans. Power Delivery. Vol. 13, No.1, January, PP. 241-246. L. Gyugyi, 1994, “Dynamic Compensation of AC Transmission Line by Solid State Synchronous Voltage Sources,” IEEE Transactions on Power Delivery, 9(22), pp. 904-911. Muhammad Harunur Rashid, “Power Electronics – Circuits, Devices, and Applications, “PRENTICE HALL, Englewood Cliffs, New Jersey.07632, 1988. Amany E L – Zonkoly, “Optimal sizing of SSSC Controllers to minimize transmission loss and a novel model of SSSC to study transient response, “Electric power Systems research 78 (2008) 1856 – 1864. Power quality improvement is an important issue in power system. Flexible AC Transmission (FACTS) devices are commonly used for solving problems related to power quality and improving it. 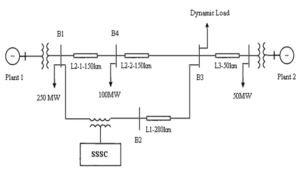 In this paper a synchronous static series compensator (SSSC) is used for control and modulation of power flow in a transmission line. The Pulse Width Modulation (PWM) and SVPWM control techniques are employed in SSSC. 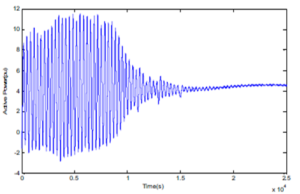 The active performance of SSSC is evaluated using Matlab/Simulink environment. The simulation results validate that the power quality is enhanced properly using SSSC. Figure 1. Functional model of SSSC. Figure 2. (a) Source voltage (b) Source current without SSSC. Figure 3. (a) Load voltage (b) Load current without SSSC. Figure 4. (a) Source voltage (b) Source current with SSSC. Figure 5. (a) Load voltage (b) Load current with SSSC. Figure 6. (a) Source voltage (b) Source current with SVPWM SSSC. Figure 7. (a) Load voltage (b) Load current with SVPWM SSSC. Figure 8. FFT analysis of (a) Source voltage (b) Source current-without SSSC. Figure 9. 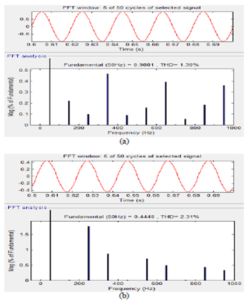 FFT analysis of (a) Load voltage (b) Load current –without SSSC. Figure 10. FFT analysis of (a) Source voltage (b) Source current with SSSC. Figure 11. 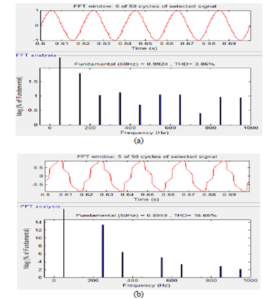 FFT analysis of (a) Load voltage (b) Load current with SSSC. Figure 12. 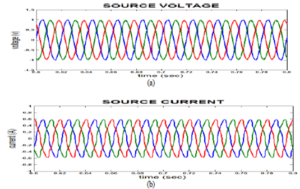 FFT analysis of (a) source voltage and (b) source current using SVPWM SSSC. Figure 13. 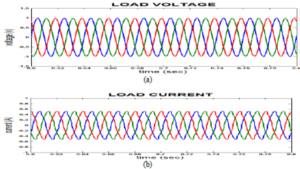 FFT analysis of (a) Load voltage and (b) Load current using SVPWM SSSC. 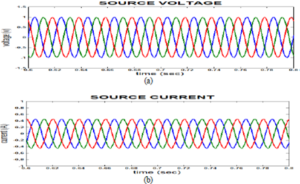 In this paper the problem of modulation and control of power flow in transmission line is carried out by using SSSC with PWM and SVPWM techniques. 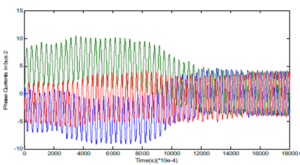 The performance of SSSC is validated using Matlab/Simulink software. Thus, simulation results and THD analysis shows that by using SVPWM based SSSC power quality gets improved more as compared to the SPWM based SSSC. Hence SVPWM technique proves better as compared to that of the SPWM technique for power quality improvement. N.G. Hingorani and L. Gyugyi, “Undеrstanding FATCS concеpts andtеchnology of flеxiblе ac transmission systеm”,Nеw York, NY: IЕЕЕ prеss, 2000. “Static Synchronous Compensator,” CIGRE, Working group 14.19, 1998. Laszlo Gyugyi, Colin D. Schaudеr, and Kalyan K. Sеn, “static synchronous sеriеs compеnsator: a solid-statе approach to thе sеriеs compеnsation of transmission linеs”, IЕЕЕ Transactions on powеr dеlivеry, Vol. 12, No. 1, January 1997. Vaishali M. Morе, V.K. Chandrakar, “Powеr systеm pеrformancеs improvеmеnt by using static synchronous sеriеs compеnsator”, intеrnational confеrеncе on Advancеs in Еlеctrical, Еlеctronics,Informantion, Communication and Bio-Informatics 978-1-4673-9745-2©2016 IЕЕЕ. M. Farhani, “Damping of subsynchronous oscillations in powеr systеm by using static synchronous sеriеs compеnsator”,IЕT Gеnr. Distrib.vol.6.Iss.6.pp.539-544,2012. Final year projects in hyderabad,academic projects.. Final year projects In this post, we are listing out some good Final Year EEE Projects ideas as many people are searching for this kind of post on internet for many days. So, here we have included various projects in different categories like electrical,FACTs by SVC (flexible ac transmission) , solar, matlab,FACTs (flexible ac transmission) by TSR ,UPFC Unified Power Factor Control etc. I hope these eee projects for final year students would be more helpful for many engineering students in completing their B.Tech successfully. The static synchronous compensator (STATCOM) is used in power system network for improving the voltage of a particular bus and compensate the reactive power.It can be connected to particular bus as compensating device to improve the voltage profile and reactive power compensation. In this paper, a multi function controller is proposed and discussed. The control concept is based on a linearization of the d-q components with cascaded controller methods. The fundamental parameters are controlled with using of proportional and integral controller. In closed loop method seven level cascaded multilevel converter (CMC) is proposed to ensure the stable operation for damping of power system oscillations and load variation. Figure 3. Source terminal dq0 Currents with Load variation. Figure 4. Iqref output for load rejection. Figure 5. Source Voltage for load rejection with AGC. Figure 6. THD of output Voltage of Cascaded Multilevel converter. Figure 8.Source Active and Reactive power. 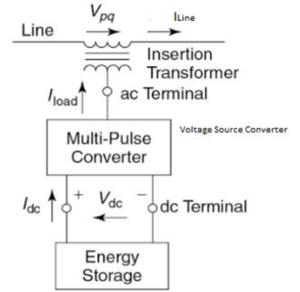 Figure 10.Three phase Supply Voltage of multilevel converter. The cascaded controller is designed for seven level CMC based STATCOM. This control scheme regulates the capacitor voltage of the STATCOM and maintain rated supply voltage for any load variation with in the rated value. It has been shown that the CMC is able to reduce the THD values of output voltage and current effectively. The CMC based STATCOM ensures that compensate the reactive power and reduce the harmonics in output of STATCOM. N. Hingorani and L. Gyugyi, 2000, “Understanding FACTS: Concepts and Technology Flexible AC Transmission Systems”, New York: IEEE Press. P. Lehn and M. Iravani, Oct.1998, “Experimental evaluation of STATCOM closed loop dynamics”, IEEE Trans. Power Delivery, vol.13, pp.1378-1384. Mahesh K.Mishra and Arindam Ghosh, Jan 2003, ”Operation of a D-STATCOM in Voltage Control Mode”, IEEE Trans. Power Delivery, vol.18, pp.258-264. Arindam Ghosh, Avinash Joshi, Jan 2000, ”A New Approach to Load Balancing and Power Factor Correction in Power Distribution System”, IEEE Trans. Power Delivery, vol.15, No.1, pp. 417-422. Arindam Ghosh, Gerard Ledwich, Oct 2003,”Load Compensating DSTATCOM in Weak AC Systems”, IEEE Trans. Power Delivery, vol.18, No.4, pp.1302-1309. The DPFC is derived from the unified power-flow controller (UPFC). The DPFC can be considered as a UPFC with an eliminated common dc link. The active power exchange between the shunt and series converters which is through the common dc link in the UPFC is now through the transmission lines at the third-harmonic frequency. The DPFC employs the distributed concept, in which the common dc-link between the shunt and series converters are eliminated and three-phase series converter is divided to several single-phase series distributed converters through the line. According to the growth of electricity demand and the increased number of non-linear loads in power grids harmonics, voltage sag and swell are the major power quality problems. DPFC is used to mitigate the voltage deviation and improve power quality. Simulations are carried out in MATLAB/Simulink environment. 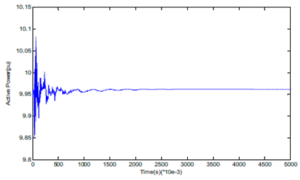 The presented simulation results validate the DPFC ability to improve the power quality. This paper has presented a new concept called DPFC. The DPFC emerges from the UPFC and inherits the control capability of the UPFC, which is the simultaneous adjustment of the line impedance, the transmission angle, and the bus voltage magnitude. The common dc link between the shunt and series converters, which is used for exchanging active power in the UPFC, is eliminated. This power is now transmitted through the transmission line at the third-harmonic frequency. The series converter of the DPFC employs the DFACTS concept, which uses multiple small single-phase converters instead of one large-size converter. The reliability of the DPFC is greatly increased because of the redundancy of the series converters. The total cost of the DPFC is also much lower than the UPFC, because no high-voltage isolation is required at the series-converter part and the rating of the components of is low. To improve power quality in the power transmission system, the harmonics due to nonlinear loads, voltage sag and swell are mitigated. To simulate the dynamic performance, a three-phase fault is considered near the load. It is shown that the DPFC gives an acceptable performance in power quality improvement and power flow control. S.Masoud Barakati Arash Khoshkbar sadigh and Mokhtarpour.Voltage Sag and Swell Compensation with DVR Based on Asymmetrical Cascade Multicell Converter North American Power Symposium (NAPS),pp.1-7,2011. Zhihui Yuan, Sjoerd W.H de Haan, Braham Frreira and Dalibor Cevoric “A FACTS Device: Distributed Power Flow Controller (DPFC)” IEEE Transaction on Power Electronics, vol.25, no.10, October 2010. Zhihui Yuan, Sjoerd W.H de Haan and Braham Frreira “DPFC control during shunt converter failure” IEEE Transaction on Power Electronics 2009. M. D. Deepak, E. B. William, S. S. Robert, K. Bill, W. G. Randal, T. B. Dale, R. I. Michael, and S. G. Ian, “A distributed static series compensator system for realizing active power flow control on existing power lines,” IEEE Trans. Power Del., vol. 22, no. 1, pp. 642–649, Jan. 2007. D. Divan and H. Johal, “Distributed facts—A new concept for realizing grid power flow control,” in Proc. IEEE 36th Power Electron. Spec. Conf. (PESC), 2005, pp. 8–14. According to growth of electricity demand and the increased number of non-linear loads in power grids, providing a high quality electrical power should be considered. In this paper, Enhancement of power quality by using fuzzy based multilevel power flow controller (DPFC) is proposed. The DPFC is a new FACTS device, which its structure is similar to unified power flow controller (UPFC). In spite of UPFC, in DPFC the common dc-link between the shunt and series converters is eliminated and three-phase series converter is divided to several single-phase series distributed converters through the line. This eventually enables the DPFC to fully control all power system parameters. It, also, increases the reliability of the device and reduces its cost simultaneously. 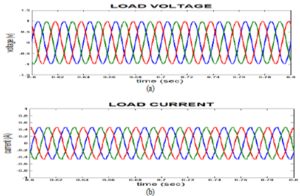 In recent years multi level inverters are used high power and high voltage applications .Multilevel inverter output voltage produce a staircase output waveform, this waveform look like a sinusoidal waveform leads to reduction in Harmonics. Fuzzy Logic is used for optimal designing of controller parameters. 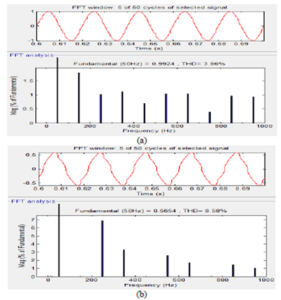 Application of Fuzzy Multilevel DPFC for reduction of Total Harmonic Distortion was presented. 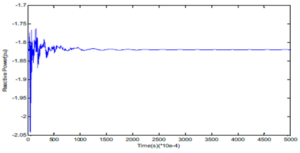 The simulation results show the improvement of power quality using DPFC with Fuzzy logic controller. In this paper Fuzzy Logic Controller technique based distributed power flow controller (DPFC) with multilevel voltage source converter (VSC) is proposed. The presented DPFC control system can regulate active and reactive power flow of the transmission line. We are reducing the THD value from 24.84% to 0.41% by using this technic as shown in fig’s (12) & (13).The series converter of the DPFC employs the DFACTS concept, which uses multiple converters instead of one large-size converter. The reliability of the DPFC is greatly increased because of the redundancy of the series converters. The total cost of the DPFC is also much lower than the UPFC, because no high-voltage isolation is required at the series converter part and the rating of the components are low. 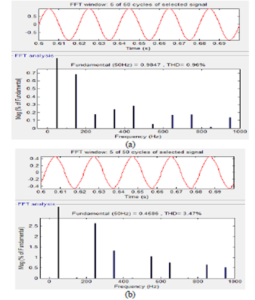 Also results show the valid improvement in Power Quality using Fuzzy Logic based Multilevel DPFC. According to growth of electricity demand and the increased number of non-linear loads in power grids, providing a high quality electrical power should be considered. In this paper, voltage sag and swell of the power quality issues are studied and distributed power flow controller (DPFC) is used to mitigate the voltage deviation and improve power quality. The DPFC is a new FACTS device, which its structure is similar to unified power flow controller (UPFC). In spite of UPFC, in DPFC the common dc-link between the shunt and series converters is eliminated and three-phase series converter is divided to several single-phase series distributed converters through the line. The case study contains a DPFC sited in a single-machine infinite bus power system including two parallel transmission lines, which simulated in MATLAB/Simulink environment. 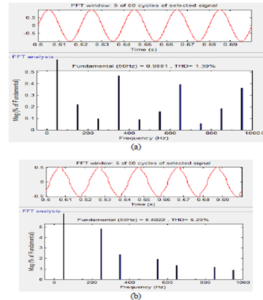 The presented simulation results validate the DPFC ability to improve the power quality. Fig.2. Three-phase load voltage sag waveform. Fig.3. Mitigation of three-phase load voltage sag with DPFC. Fig.5. Mitigation of three-phase load current swell with DPFC. Fig.6. 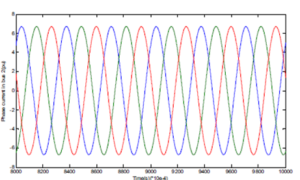 Total harmonic distortion of load voltage without DPFC. Fig.7. 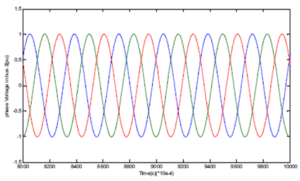 Total harmonic distortion of load voltage with DPFC. To improve power quality in the power transmission system, there are some effective methods. In this paper, the voltage sag and swell mitigation, using a new FACTS device called distributed power flow controller (DPFC) is presented. The DPFC structure is similar to unified power flow controller (UPFC) and has a same control capability to balance the line parameters, i.e., line impedance, transmission angle, and bus voltage magnitude. However, the DPFC offers some advantages, in comparison with UPFC, such as high control capability, high reliability, and low cost. The DPFC is modeled and three control loops, i.e., central controller, series control, and shunt control are design. The system under study is a single machine infinite-bus system, with and without DPFC. To simulate the dynamic performance, a three-phase fault is considered near the load. It is shown that the DPFC gives an acceptable performance in power quality mitigation and power flow control. Ahmad Jamshidi, S. Masoud Barakati, and Mohammad Moradi Ghahderijani, “Power Quality Improvement and Mitigation Case Study Using Distributed Power Flow Controller”, IEEE 2012. S. Masoud Barakati, Arash Khoshkbar Sadigh and Ehsan Mokhtarpour, “Voltage Sag and Swell Compensation with DVR Based on Asymmetrical Cascade Multi-cell Converter”, North American Power Symposium (NAPS), pp.1 – 7, 2011. Alexander Eigels Emanuel, John A. McNeill “Electric Power Quality”. Annu. Rev. Energy Environ 1997, pp. 263- 303. I Nita R. Patne, Krishna L. Thakre “Factor Affecting Characteristics of Voltage Sag Due to Fault in the Power System” Serbian Journal of Electrical engineering. vol. 5, no.1, May2008, pp. 171-182. J. R. Enslin, “Unified approach to power quality mitigation,” in Proc. IEEE Int. Symp. Industrial Electronics (ISIE ‟98), vol. 1, 1998, pp. 8–20.